Follow me on this example: Your local dentist might send out a postcard to her ideal demographic offering a free cleaning. You come in for the free cleaning and while there, she mentions that your teeth are looking a little stained and he could whiten them while you’re there. You agree and while she’s whitening them, she notices that you must have had braces as a child and it seems that your teeth are shifting again. So she sells you into a retainer. And over the course of the return visits, you buy an expensive toothbrush, opt for cosmetic surgery, etc etc. The point of this example is that every business, brands included, have a value ladder to nurture customers through to incrementally increase revenue. What’s your value ladder? Image courtesy of Russel Brunsen, author of DotComSecrets. Using our dentist example, maybe your revenue isn’t increasing because you only sell retainers and you’ve maximized those potential people. What’s next? You need to create (or oftentimes just reposition) products that get people into your door – the free cleaning and whitening services level people. And once you’ve tapped out all of those folks, and now you need to create a “cosmetic surgery” – that is, a high-end – package. We worked with a very well-known national boutique fitness brand that did this extremely well. They had an online workout membership you could subscribe to. And the next upgrade was an in-studio class package. And after that, the next upsell was prepaying an annual studio membership. And for the handful interested, they offered an ultra-exclusive in-person wellness retreat hosted by the founder of the company. How can you create packages and reposition products to create entry, mid-tier, and high-end offerings to ensure incremental revenue? Are You Treating Search as Shelf Space? And more, but those were the key points. This speech didn’t sit right with me, though. For a company with brands that have a strong Direct-to-Consumer channel banking double margins, why in this decade are we still counting on building brands firstly through wholesale and retailers? They are a key component of a holistic business, don’t get me wrong. But that can’t be central focus. Some of the most successful D2C brands out there understand that Google is the new shelf space. And dominating that shelf space is the key. Dominating doesn’t happen by just ranking well organically. That’s the first step, sure. But you really need to dominate that SERP with all the other tools in your tool belt. If you’re taking up page 1, that’s that much further you push your competition down the page and that’s that much more market-share you take. The Brand Panel: populate it with as much info as possible, upload compelling imagery, create posts, and populate some of the Q&As. It’s rare that we find a brand that is approaching search with the mentality as traditional retail shelf space. (Nestle Waters, of all companies, gets it… talk about a boring, traditional retail brand.) But when they do, traffic shoots up, sustainable growth happens, and bottom-line profitability is often improved. Instagram has made some changes in the last week that’s affecting every brand we’ve been in contact with. Reach has tanked yet again, followers have been lost, then gained back, then lost again, and engagement is dropping by the day. A key trend we’re seeing happen for brands starting as early as January 2018 is that brands that had been built on organic social strategies like social influencers, great content and authentic engagement with their audience can’t get by with those same strategies any more. They’re important still for sure, they’re just not pulling in the same magic they once were. We love organic strategies, and you should still too. Organic is part of what builds a profitable marketing mix that can sustain for the long-haul. And organic is what gives ground cover to test new things with marketing dollars, fail, iterate, and eventually find those veins of gold. You can’t build your castle on rented land. 2019 is only proving further that the social media platforms will change on a dime and brands need to take back some ownership if their revenue growth from these giants. If you haven’t invested in long-term, sustainable SEO it’s time. If you haven’t focused on email list growth, it’s time. If you’re not leveraging the earned media your PR team is getting it’s time. We’ve made it through another Cyber Five (the fancy term for the shopping bloodbath between Thanksgiving and Cyber Monday) and the MAKA Digital team is breathing a sigh of relief and catching up on our ZZZs. Though Cyber Five was crazy, as always, it was also the best one yet—revenue numbers were higher than last year nearly across the board, and we gained worthwhile insights and learnings to be applied next year, the best of which we’ll share here. Most of our clients’ campaigns launched at 12:00 a.m. on Black Friday in their respective time zones. But those who launched days before, or even just hours before, saw powerful revenue numbers come through before the clock even struck midnight. One client made 6% of their total Cyber Five revenue on Thursday night just by launching around 10:00 pm Pacific rather than 12:00 am Pacific. Our major takeaway here: As the biggest retailers, both online and brick-and-mortar, push their Cyber Five campaigns earlier and earlier into the week, other companies are smart to follow suit and launch their campaigns on Thanksgiving or even test launching on Tuesday or Wednesday. It’s a common strategy to include mentions of Cyber Five sales in paid search and shopping campaigns, but another channel that can benefit from this practice is organic search. During Cyber Five we ran a test for one client in which we updated their homepage meta description to mention their weekend sale, and this updated text received a click-through rate that was a full percent point higher than their traditional meta description. A word of warning, though—updating meta descriptions is dependent on Google’s bots and how fast they can crawl your website and update the new text in Google’s search results. Reverting back to regular text after the sale is also dependent on Google’s bots again crawling the site in a timely fashion, which leaves the potential for the sale-themed meta description to still be live after the sale is over. The best way to combat any confusion this may cause is to emphasize the timeframe of the sale within the text, such as “Shop our biggest sale of the year, through Cyber Monday,” or something similar. You can also force Google’s bots to crawl your site through the “Fetch as Google” link in Google Search Console, though it’s still not a complete guarantee that all text will be updated immediately. Within the social media campaigns that ran over Cyber Five, we saw stronger responses to any imagery that was holiday-themed. If you’re not sure which holidays your customers celebrate, feel free to stick with a general holiday aesthetic—gift wrapping, lights, snow, pinecones and berries, or even just a red, green, gold or blue color scheme work well. Anything that’s outside of your traditional creative imagery will signify to viewers that this ad is something special and worthy of their attention. For us these holiday ads generated click-through rates that were roughly double our traditional ads. The option to check out with PayPal is ubiquitous across the internet by this point, but there are many other payment options that are worth considering if they’re not already implemented on your website. Apple Pay, Amazon Pay, and Google Pay are some of the big players in the space, and the options will only grow as digital eCommerce expands. Though there are fees with any third-party payment tools, they can help to increase both checkout conversion rates and customer trust, as a study by Bounteous showed that 40% of shoppers feel more secure purchasing from a site with multiple payment options. In addition, if you carry products with high price points, consider offering financing options on your website, such as paying for the product in multiple installments. This will cause the product to appear cheaper and can help overcome any reservations customers may have with the pricing. Now that we’ve shared a few insights, we’d love to hear what you learned this Cyber Five. Drop us a line at hello@makadigital.com, and in the meantime, we’ll be gorging ourselves on sugar cookies and peppermint bark. From the team at MAKA Digital, happy holidays. Google's New, Bigger Ad Format — Is It Worth The Hype? It’s been three months since Google changed the world as we know it (or maybe just our world) by announcing a new wave of changes to its advertising platform. These changes included a new paid search ad format called responsive search ads (RSAs), and here at MAKA Digital we were excited to dig in and try them out, as they were built to allow for bigger headlines and descriptions than traditional ads, as well as an automated way of testing which ad text is the most successful. There was a lot that initially seemed worthwhile about RSAs. Larger headlines and descriptions are never a bad thing for enticing viewers to click on your ads—they provide more information about your brand and they take up more real estate on the search results page. These ads also allow you to give Google a group of different headline and text ads, and Google will dynamically serve these in different combinations until it finds the combination that leads to the best click-throughs and other metrics. Google said that in early tests RSAs had led to higher click-through rates, and all these factors combined seemed to make them a slam dunk. When we first launched RSAs in isolated campaigns, the outlook looked good—during those first few weeks, they showed higher click-through rates and lower CPCs than traditional ads. Fast forward to several months later, though, and the prognosis doesn’t sound as great. Since those first tests we’ve run RSAs across several client accounts, and the results have changed (read: performance staled in a big hurry). Click-through rates are still occasionally higher, but often only within campaigns focusing on brand-related keywords, and sometimes even then they’re not any higher than traditional ads. And they haven’t led to a significant change in conversion rates, either. This a phenomenon that’s been echoed industry-wide. This turn toward low performance seems counterintuitive. Why wouldn’t bigger ads/longer text lead to more clicks? We’re not sure, but it seems it has something to do with Google dynamically optimizing for the best-performing text combinations—this appears to have caused click-throughs to worsen, not improve, indicating that Google’s bots are simply not as adept as human marketers in judging which text is truly the better performer. Google also has not offered much help in analyzing its selected combinations of text within an ad, with only impression data available to view here rather than click-throughs or conversions. At this point, we’ve taken to analyzing RSAs at an individual level—if one appears to be performing strongly for a certain group of keywords, we’ll keep it in place, and if it’s underperforming in another group of keywords, we’ll turn it off in favor of traditional ads. Though overall trends show that RSAs are not all they cracked up to be, every keyword group is different, and it’s worth weeding through for any black sheep. If you’re ready to turn off all RSAs, though, don’t be afraid—Google has promised that they won’t be sunsetting traditional ads, so they’ll always be a viable option to return to. Even better, traditional ads now offer longer headlines and descriptions, which is a great option to try if you’re not seeing success from RSAs. In upcoming months we’ll be waiting for Google to fine-tune its dynamic text combinations and provide more metrics to compare these combinations, and maybe then we’ll give RSAs more weight. In the meantime, we’re appreciative that human marketing instincts have won at least one battle against Google’s all-powerful bots. Still have more questions about RSAs vs. traditional ads? Did all the acronyms and metrics we mentioned sound like mumbo-jumbo? Give us a shout out at hello@makadigital.com and we’d be happy to talk it through. Facebook has been giving us no shortage of changes recently—from limits on organic reach for businesses to new policies regulating political content. If you’re still trying to catch your breath from all this, we don’t blame you—but don’t let your guard down just yet, because there’s a new round of changes coming your way. Luckily, these are likely to be in your favor. Click on the “General” tab of your page settings, and on the right side of the page, look for the “Audience Optimization for Posts” section, which should appear under the “Visitor Posts” section. If you don’t see it, your account likely hasn’t received it, so sit tight! If you do see it, you’ll need to enable it. Click the “edit” button in that section, and when the box expands, check the option to “allow preferred audience selection,” and save changes. You now have the ability to use audience targeting for organic posts. Write a post as you normally would on your company profile page, and then select the drop-down menu on the “Public” option—you’ll see a “New Feed Targeting” option with a target next to it. You can also choose restricted audience, which will show your post to certain ages and locations. This latter option is recommended if you’re a local business trying to limit your viewers to only your specific location, or otherwise trying to drive in-store results. So what are best practices for news feed targeting? If you’ve run promoted (paid) posts to specific audiences in the past, you’ll want to choose the top-performing audiences here and apply them to your organic targeting. If you’ve never run promoted posts and don’t have audience insights, start from the ground up and test different audiences on your organic posts to determine which will perform the best. Specific interests are often better than broad (“high-heeled footwear” versus “shoes”) and brand interests can also be effective (“Lululemon Athletica,” etc.). Smaller audiences are typically better—if Facebook’s estimated reach for your audience is surpassing the 1 million mark, narrow your interest selection or apply age/gender/location restrictions to bring down reach numbers. One thing to note is that targeted audiences are marked by Facebook as being “more likely to see your post,” meaning that the post can still potentially serve to people outside this interest targeting. This is not the case if you choose a restricted audience; here the post will serve only to those in that demographic or location. On the topic of company profile pages, there’s a big change happening there, too—Facebook is also rolling out a larger selection of profile template types to choose from. The full list of new template types features Services, Business, Venues, Movies, Nonprofits, Politicians, Restaurants and Cafes, Shopping, Video Page, and Standard. These are intended to offer tailored features for each page type—Movie pages will highlight showtimes, while Shopping is designed to showcase products. Business templates include places for special offers and job postings, and may be best for B2B companies. If you’re not sure which template best fits your business, not to worry—as soon as they’re available to your page, you’ll be able to browse the features of each, and you can also change your template at any time. Visit your page settings and the “Edit Page” tab to browse and select a template. You’re likely to receive an email from Facebook when the new templates are available to you, and your template may also be automatically transitioned by Facebook (only if you don’t take action on it yourself within a certain window of time). With its wider selection of business page templates and new audience targeting features, Facebook seems to be trying to compensate for the hits businesses have taken in its recent algorithm changes. As you dive in, let us know how they’re affecting your business page, or reach out to us with any questions at hello@makadigital.com. Video captioning is the easiest thing you can do to increase organic video views on Facebook — here's how. Did you know that 85% of viewers watch Facebook videos with the sound off? It’s a staggering number, but it makes sense, doesn’t it? After all, you’re often on Facebook during those “in-between” moments—while waiting in a doctor’s office, standing in a long line at the post office, or putting off that work project you really need to start. And during those times you don’t necessarily want your volume to be blaring (especially if you’re watching your favorite “Company is Coming!” video for the umpteenth time). This is why it’s so important to have captions available on all of the videos you create for Facebook. It’s even more important when you consider that captions increase the accessibility of your videos, as many Facebook users have hearing disabilities that render closed captioning absolutely necessary for watching a video. If you’re not convinced yet, here’s another statistic: captions can increase video watch time by up to 12%. We believe that the benefits of video captioning outweigh the risk of them being distracting for some users. In addition, Facebook allows for the creation of captions that can be turned on and off at the viewer’s discretion, so they can be easily disabled. In fact, Facebook will even create these captions for you. Read more here on how to have Facebook automatically generate captions on video posts. This is the easiest form of captioning and the best for rookies; just note that it will likely require a bit of editing afterwards to ensure accuracy. Another option entirely is to include imbedded captions in your video rather than generating them after the video is finished. These can be more aesthetically pleasing since they offer the opportunity to customize fonts, colors, and sizing, but they are also more time-consuming to build, and they aren’t able to be removed from the video if a viewer finds them distracting. Ultimately, imbedded captioning is recommended if your video includes dialogue that is difficult to understand (such as this anesthesia-filled teenager who’s just had her wisdom teeth out and is planning her wedding to Captain America). Think you only need captions if your video includes dialogue? Think again. Even narrated videos can benefit from captioning that allow viewers with their sound off to follow along. This written narration can be included on videos that highlight new technology, travel destinations, eCommerce products, or even just gossip about the royal wedding. Video captioning has become so popular that Facebook even offers it on live videos, which is generated through a third-party captioning service provider. And what about Facebook’s cooler cousin, Instagram? Strangely enough, Instagram has not yet fully boarded the captioning train. As of the writing of this post, Instagram does not offer the ability to generate captions for your videos or upload them as separate files, meaning your only option is to imbed captions into your video. Still, if running a long or dialogue-heavy video on Instagram this is recommended, especially as video becomes an increasingly popular post format on the platform. The bottom line of video captioning is this: you’ve put time and energy into creating a quality video for your audience. You want as many people as possible to watch that video. That being said, why wouldn’t you utilize a reasonably simple (and free!) way to encourage more viewers to watch your video? If you’re not putting captions on your videos, you’re risking losing a viewer as they instead scroll toward another cat video. Still have questions about putting captions on your videos? Not sure which method is right for you? Reach out at hello@makadigital.com and we’d be happy to help. Disclaimer: this post was written in partnership with attorney Christina Scalera but is not legal advice. Please consult your legal counsel to ensure GDPR compliance. The GDPR was designed to help protect us as internet users from these breaches of trust. It is designed to do that in two ways: (1) it makes consent to use your name, email and other data optional, and (2) if there is a breach, it forces the site/shop to tell you within 72 hours, not months and months after a cyber attack or hack. You target European countries for sales, including the United Kingdom. HOW CAN I BECOME GDPR-COMPLIANT? Here’s an online checklist you can reference to see if the remainder of your website is GDPR compliant (Please note that these templates and checklists are not affiliated with MAKA Digital). Once you have updated your TCPP and website, it is best practice to email consumers about this update. STEP 2. CONSENT TO OPT-IN IS NOW REQUIRED. Unfortunately, where Step 1 (see above) used to be enough, it no longer is under the GDPR. One of the major changes is the requirement that you get consent from the visitor when they opt-in to your communications and visit your website. When a consumer from the EU opts in to receive communications from you, there is explicit language and checkboxes that now need to be included on your opt-in forms. Reference your document templates or legal advisor for approved language. This consent has to be freely given, so online business owners will need to make sure any opt-in forms aren’t checked ‘yes’ by default if the visitor is from the EU. For traffic coming from the EU, they need to be shown a notice about cookies used on your site. This can be achieved by using a cookie bar that pops up a notification. Many website platforms also offer plugins to automatically detect EU visitors and show this notice. If you are on a common website platform it is worth searching the app/plug-in store for a solution. STEP 3. KEEP LEARNING ABOUT THE GDPR. The truth is we only know how this thing is going to look and work in theory until the EU starts enforcing it, and we don’t know when that will be. While the GDPR officially takes effect on May 25th, it’s best to stay up-to-date on news even after this point to make sure your webstore is continually compliant. We’ll keep you updated on future news, and feel free to drop us a line at hello@makadigital.com if you have any questions. Facebook's latest privacy changes — how will they affect your business? Facebook is facing Congress over the sale and transfer of user data (without user consent) from a Facebook app developer to data analytics firm Cambridge Analytica in 2010. Facebook is also under investigation for the role they played in Russia influencing the US presidential election. How will it impact me as an advertiser? For the purposes of this post, we are focusing on the Cambridge Analytica topic and its potential impact. In short, as we are writing this, there is not yet a significant impact to marketing capabilities and advertising performance on Facebook. Facebook has begun phasing out targeting options that use 3rd party data from data aggregators such as Experian, Acxiom, Epsilon, and Oracle Data Cloud. This includes targeting options regarding purchase behaviors and profiles, such as those who own a Honda or frequently purchase fitness gear, for example. In upcoming weeks Facebook is also expected to phase out income targeting, as well as certain education and job title targeting. It is worth noting that these constitute a small subset of targeting options, and businesses using Facebook ads are still able to reach highly targeted, relevant audiences based on interests, geography, and other demographics. In the long term, we anticipate there will be restrictions around data policy, data access and targeting capabilities that will impact how ads can be delivered and to whom they can reach. These restrictions may impact advertising performance. For now, the social media marketing industry is very much in wait-and-see mode as this story is developing and unfolding daily. Currently we believe the that positives of Facebook marketing still outweigh the negatives. We don’t expect brands who continue to advertise on Facebook to experience backlash from customers. However, you are the best judge of what is right for your business, and should you decide to move away from Facebook advertising, there’s myriad other options available to you in the digital marketing space, such as Google and Bing ads, Pinterest ads, and YouTube ads, just to name a few. Want to dive deeper into Facebook audience targeting or other digital marketing channels? We’re always happy to talk. Drop us a line at hello@makadigital.com. Instagram Stories boasts over 300 million daily users, according to AdWeek, while users typically spend 24-32 minutes a day on the Instagram platform. This is a huge, highly engaged demographic that shouldn’t be overlooked. You can’t afford to be missing out on this. Here’s how to get started. The “swipe up” feature allows you to send your viewer to a custom URL when they swipe up on your story (think product pages, event pages, etc.) Currently, the ability to add the swipe up feature is only available in organic stories if you have more than 10,000 followers. Stay away from making your stories feel too much like a stiff advertisement. Most of your followers will view them in a line-up of stories from friends and other personal accounts, so you’ll want your stories to feel natural, raw and fun. This is the perfect place to use text and emoji overlays or filters like stop-motion and boomerangs. Here’s a guide for using all this and more in your Instagram Stories. Because you have so little time to get your message across (Each segment of an Instagram story lasts a maximum of 15 seconds, and paid advertisements are limited to one segment) you need to skip the fluff and get straight to the message. Clearly state or show the purpose of the Instagram story, such as a limited time deal or new release, and make sure you include your brand name or logo so there’s no doubt as to who is displaying this message. If you’re creating organic Instagram Stories that will be seen by your followers (aka people who are already familiar with your brand) give them something special and make them feel like they’re part of an insider’s club. Take viewers inside your office and shoot quick cameos from members of your team (just make sure they’ve had time to fix their hair) or offer behind-the-scenes footage into the production of your product. Make sure you’re highlighting the unique value of your product or company. Launching a new product soon? Use Instagram Stories as a way to tease the new product in the days and weeks before the launch. Hitting up a trade show? Advertise the event and your booth number beforehand, and then do videos from the event itself. Have partnerships with social influencers? Try clips of them using your product. Should you take the leap into paid Instagram Stories? If you’ve seen strong engagement and some website traffic and revenue flowing in from your organic Instagram Stories, you’re likely ready to dive into paid Instagram Stories. Even better if you’ve already been running traditional Facebook and Instagram ads. It doesn’t matter how high your Instagram follower count is; you can push Instagram Story ads out to those beyond your followers. When making Instagram Story ads, keep in mind that ads have to be kept to a 15 second maximum (if you’re running an image it will remain on the viewers’ screen for 15 seconds). You only get one 15-second segment, unlike organic stories, which are allowed multiple. (I know. Life isn’t fair.) For this reason it’s more important than ever to get straight to the point. Clearly state your call to action. If running a video, it’s best to include your brand name or logo at the end for viewers who don’t already know you. Choose your objective before choosing your audience. If you want to use your ad to drive brand awareness, chose a prospecting audience that’s unfamiliar with but likely to be interested in your product. If you’re just looking to drive revenue, start with a remarketing/retargeting audience that’s been to your website or engaged with your social media profiles. We’ve found this audience is the best for following the Stories funnel down to a purchase. 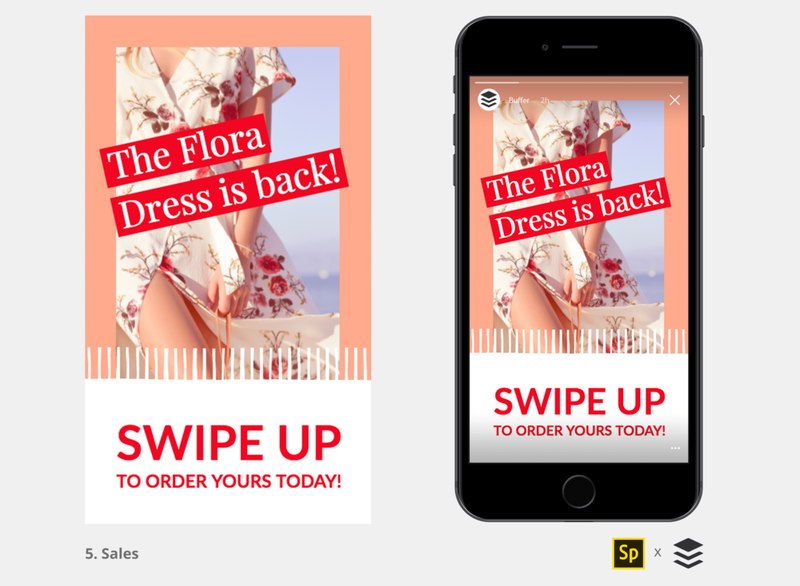 When choosing the placement for your Instagram Story ads, make sure you choose mobile only. It’s unlikely that people will see your story on desktop, but there are ways to do it, and viewing on mobile will provide a better experience. And that’s it! Just remember to keep your Instagram Story fun, natural, and to the point. And if you have any questions—or have never touched Instagram Stories before and are feeling overwhelmed by all this data—feel free to reach out to hello@makadigital.com. This stuff is our jam and we’re here to talk you through it. On January 11th, 2018 Facebook announced big changes to the news feed as we know it. With this update, content from brands and groups will now appear in a separate news feed entirely, called the "Explore Feed". This essentially creates two news feeds now - the main feed where we all will continue to see content from family and friends, and the Explore feed where content from everybody else will appear. These dual feeds will undoubtedly cut organic reach even further for pages. Organic reach is only around 2% currently. In dual feed testing that began in European markets in October 2017, businesses saw organic reach drop again by two-thirds and with four times fewer interactions. But not all is doom-and-gloom. Here are 7 key tips you should begin implementing now to stay ahead, maintain (or even improve) organic reach, and make the most out of your Facebook dollars. Save promotional content for paid ads. Contests, giveaways and posts containing links to external websites are all posts Facebook considers as "overly promotional" and will therefore drop the organic reach these posts would normally have. Post less, but offer more. Posting multiple times a day will be less important and posting things of substance - usually things that entertain or educate - will be well-rewarded. While targeting posts is nothing new to the paid side of the Facebook house, it will be introduced to organic posts for the first time. For example, a clothing brand could target their organic posts in such a way where their page would appear be male-focused for a male user viewing that page and women-focused for women following that page. These posts should follow much of the same best practices for targeting as their paid counterparts, and will be rewarded with higher placement based off engagement and relevancy. Make sure the content of your organic post is closely matched to audience you target. Run different versions of posts to different segments of your audience. Mobile makes up 88% of Facebook impressions. With more daily users on the mobile platform than ever before, it is becoming absolutely essential to make sure everything from your post content to your image or video to your website landing page displays comfortably on mobile devices. Content that is optimized for mobile will get stronger engagement and secure more time at the top of the feed. If Facebook has been telling us anything, it is that it cares about video. With the launch of “Facebook Live” and “Facebook Watch” over the past couple years, Facebook has been pushing video more than ever, and that does not slow down with this update. Video posts garner by far the most engagement for pages, and will make up the majority of content we will see at the top of the Explore Feed. Facebook Live is a free spot at the top of the feed. Live videos appear in the “stories” bar at the top of the feed along with being announced in the feed itself. Facebook has been pushing this medium over recent updates and will continue to reward successful use of the feature. Find creative ways to go Live often and encourage your followers to get involved. Video completion rates will now determine how successful Facebook deems your video. A 30 second video that people are watching for 20 seconds is far more valuable than a 5 minute video people watch for a minute. Think short, sweet and communicate your message right off the bat. Optimize for no-sound. With more people viewing content on-the-go in public spaces, the vast majority of content is being watched without sound. Adapt videos to make sense with sound needing to be played and utilize subtitles for higher completion rates. Videos with square aspect rations perform better than landscape or portrait videos as they are easier to consume on the mobile platform. While advertisements will still appear in people’s newsfeeds, Facebook has more ad placement options than ever before. Sidebar ads and messenger ads being some examples of frequent places for promotional content to display to users. By optimizing various versions of ads to fit specific placements, advertisers can prioritize themselves in these spots by being the most engaging ad for that placement. This will ensure that ads appear in as many locations in the platform as possible. A new ad objective that Facebook released late last year is the ability to have people message your page directly in Facebook Messenger via a call to action button in your ad. This feature will be increasingly important as it becomes harder and harder for pages to organically get their brand in front of people. This type of personalization is also exactly what Facebook is hoping will improve it’s user experience, and these types of ads will place very well when used correctly. Facebook ads run on an auction system and that auction system is what creates the costs we all pay as advertisers. With this dual-feeds update, there will undoubtedly be more bidders entering the ad space, driving up costs for everyone. For our ad budgets to go just as far as they have in the past, or ideally even further, advertisers will need to manage their campaigns, ad sets, ads and audiences with a hyper-segmented approach. Think lots of small well-defined audiences, lots of creative optimized for the various placements (mobile, Instagram, Stories, etc), lots of well-crafted messages tailored specifically to audiences. This approach is in contrast to a "broadcast approach" many advertisers have gotten away with in the past, where one message/ad/creative unit could serve many masters with very little segmentation. On a final note, we should except the dual-feeds to roll out first for Facebook in the coming months and then for Instagram in late 2018. We love talking shop. Reach out to us at hello@makadigital.com and let's strategize on your approach to social this year to leverage this change to stay ahead. From all of us at MAKA Digital, happy holidays to you and your loved ones. We hope your holiday season is filled with fun and relaxation and that you have a great start to 2018. To our clients, thank you for an awesome year — we love working with each and every one of you and we look forward to another great year! As 2017 draws to a close, it’s time to take a look back at the year in digital marketing—so much has happened this year, both inside and outside of the industry. While you’re trying to make sense of all the crazy headlines that filled the news during the past 12 months (and digesting all the cookies you ate at the office holiday party) we’re digging into events like a new Google AdWords interface, the overturn of net neutrality, and the ubiquitous adoption of voice-activated assistants like Alexa. That being said, we all know that digital marketing is ever-changing and will likely change even more in 2018. Advertisements pop up in new channels and places every day. But one thing that never changes is the need to understand and appropriately target your consumers. This is why our biggest insight from 2017 is the need to constantly create consumer-focused marketing strategies even when everything else in the industry seems to be changing. Advertising now appears in Facebook messenger, Google Home and more—but it also has to become more granular in targeting consumers if it wants to remain effective, especially as many millennials and other shoppers become increasingly distrustful of traditional marketing. In 2015, 84% of millennials said that they didn’t trust traditional advertising, which may correspond to a drop in trust for media, business and government. People do, however, show trust for brands who work to establish a personal connection. 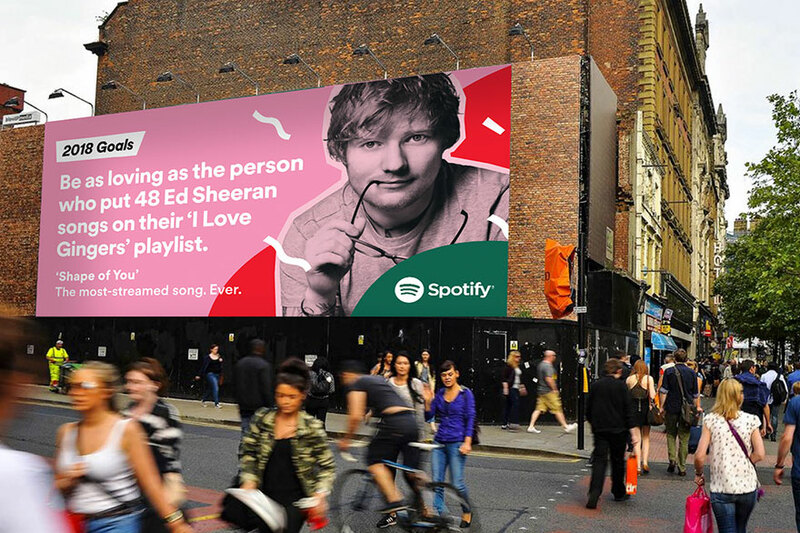 Spotify loyalists can all see their own music idiosyncrasies reflected in these ads, as well as popular cultural references. But the ads represent more than this—at their core they highlight the consumer, not the brand. They’re not shoving traditional “Buy now” messaging at the viewer. And this relates to Spotify’s overall brand goal—focus on people, not data points. So how can you apply this idea if you’re not a multi-billion-dollar company? Here’s the answer: by listening to your customers. And one major step you can take to achieve this goal, if you haven’t already, is connecting with your followers on social media. It’s not enough to simply throw up a few Facebook posts and then turn a blind eye to the comments—make sure you’re actively responding to as many comments as possible, with gratitude for those that express loyalty and a genuine apology and assistance for those that express aggravations. You can even reach out to loyal fans with a personalized coupon, or engage in a Twitter conversation with customers (though we can’t all be as funny as DiGiorno Pizza). In addition, see what others are saying about your company—either on social media or elsewhere—and take their thoughts into consideration as best you can. In the midst of A/B tests and influencer campaigns, make sure your consumer’s voice is still driving everything you do. Make sure your ads are tailored to them—and if you’re not sure how to do that while still maintaining a strong call to action, we’re here to help. Here’s to strong marketing performance—and customer relationships—in 2018. When you first dive into the world of social media marketing, it can be difficult to know how to analyze the performance of your ads and posts. Facebook in particular has a myriad of data to offer on every ad you run—everything from clicks to CPAs to the age and gender of the people viewing your ads. And two of the metrics we often consider to be the most important—engagement rates and conversions—come with their own set of difficulties. Engagement rates can vary wildly between picture posts and video posts, and conversion numbers are often reported differently in Facebook than they are in Google Analytics, another tool that’s often used to gauge the results of marketing efforts. So how do you make sense of everything? We’re here to break down these two common sources of confusion. Why are engagement rates on Facebook videos so much higher than regular Facebook posts? This is a question we often hear from our clients. Oftentimes they’ll run an organic or boosted post comprised of pictures or text, and see a much lower engagement rate on these than they do on videos, which can sometimes drive engagement rates as high as 70% or 80%. These numbers are a bit misleading, though, as Facebook counts a video engagement as anyone who views the video for 3 seconds or longer—a loose definition that’s fairly easy to reach. On the other hand, engagement for a picture or text post is defined as anyone who likes, comments, shares or clicks the post—here an action actually has to happen, rather than just passively viewing a video. This is the primary reason why video posts show such higher engagement rates than text or picture posts. Don’t spend too much time worrying if a text post comes back with only a 2% engagement rate in comparison to a video post that generated a 40% engagement rate—you’re comparing apples and oranges. Instead focus on comparing your posts to others of the same type. Why do Google Analytics and Facebook show different conversion numbers? This is another question we often receive from clients. Their Facebook dashboard will show 27 conversions generated from an ad they just ran, but Google Analytics will only report 11. Why is there such a discrepancy between these numbers? It has to do with the way Facebook and Google Analytics track conversions. Facebook uses a method called view-through conversions, which counts a conversion as anyone who sees the ad and then later goes on to purchase, whether they clicked through the ad or not. So, potentially, a viewer could briefly see the ad on their Facebook newsfeed and ignore it, but if they Googled the company a few days later and made a purchase, Facebook would still attribute this conversion to that Facebook ad. Google Analytics, on the other hand, tends to be more conservative with their method of measuring a purchase. They only consider click-through conversions, which is defined by someone actually clicking on a Facebook ad and making a purchase after that click (It’s important to note that these can also include assisted conversions, which is when someone clicks through an ad, but then leaves the website and eventually returns to make a purchase through a separate avenue, like another ad or a Google search. As long as that initial click happens, Google Analytics counts it). So which type of tracking should be given more weight? We typically consider the Google Analytics method more reliable, as it allows you to see exactly who clicked on an ad and ultimately made a purchase because of that click. That’s not to say that Facebook conversion metrics should be thrown away, but they should be taken with a grain of salt, because they make it harder to tell whether someone directly clicked on the ad or simply saw the ad, and, in this case, to what extent they really paid attention to the ad. So, there you have it—now you can dig into these common metrics on Facebook with the confidence that you know exactly what they mean. If and when more questions pop up, we’ll be here to answer them. Just drop us a line at hello@makadigital.com. Now that I have an insider’s perspective on social media, I’ve come to realize all the fascinating—and creepy—ways it offers up audiences to advertisers looking to send out an ad. Every time you see a sponsored post or ad on your newsfeed, it’s not just randomized, or a coincidence—it’s targeted specifically toward you because of your activity on the platform and the pages you’ve liked. Facebook, for example, even keeps tabs on your online shopping habits. We’ve all browsed for something on the Internet, whether it’s shoes, a DVD set, or a specific kind of car. Over the course of the next few days, that exact product suddenly pops up in ads all over the web, including on your social media. The first time this happened to me, I felt a little unnerved. How did Facebook know that I’d been wanting tickets to Wicked, or that I’d been shopping for new winter boots? This method of advertising is called retargeting or remarketing, and it’s actually fairly straightforward. Most ecommerce sites track your activity on their site through cookies, and that activity is stored in a database. They then create ads that dynamically fill with whatever items you’d been viewing, and then pay to serve those ads across search engines, partner websites and social media. And that’s not even the weirdest way that the internet keeps track of your activities. When an advertiser creates ads on Facebook, they can reach any number of highly specific demographics. You can be targeted based on your job title, estimated income level, or whether or not Facebook believes you to be a parent. There’s specific audience categories for “Fit Moms,” “Soccer Moms,” and even the ambiguous “Trendy Moms.” Do you have a close friend with a birthday coming up? There’s a category for that, too. There’s even a category for Facebook users who have recently returned from vacation. So how does Facebook know all this? It’s due to the profile information you’ve provided, the life events you’ve posted, things you’ve liked and clicked on while using Facebook, and even the things you do and purchase on the rest of the web (again, often tracked by cookies and other mechanisms). There’s even been the rumor that Facebook listens to your private conversations through your phone’s microphone and then uses those conversations to serve you tailored ads, but Facebook has since dismissed this claim, saying it only accesses your microphone when you record videos or use another feature that requires audio. The moral of this story is that Facebook likely knows more information about you than you know about yourself. But this isn’t quite as bad as it seems—because it knows so much about you, it’s able to serve you relevant ads for products and websites that are likely to interest you. If you remove this capability the ads won’t disappear, they’ll just become much more random and disparate to your needs. And, from a marketing perspective, this Facebook targeting allows advertisers to hone in on the exact groups of people who are likely to find our ad relevant and consequently click on the ad. This gives us the ability to place products in front of appropriate audiences, and it gives you the ability discover new products or return to those you’d been considering. My overall takeaway is that there are much worse things in the world than Facebook knowing you just returned from a trip to Cancún (How about some sunburn cream?). Hey, everyone! My name’s Amy, and I’m MAKA Digital’s newest intern. I’ve been with the company for about three months now (has it already been that long?! ), and it’s certainly been a wonderful (and overwhelming) summer. When I first came to MAKA I knew very little about the world of digital marketing, and now, just three short months later, I’ve become an expert on all things digital marketing. Well, I like to pretend I have, anyway. Maybe I’m not there yet, but I’m certainly on my way. Today I’ll be sharing with you some things that I’ve learned and how it will help your experience as our client. I entered the doors of MAKA a fresh-faced college graduate with a degree in English and journalism. I could write, I was somewhat adept at social media and I knew a bit about SEO. That’s where my digital marketing experience ended. Soon, though, I was thrown into the world of PPC and CPC and B2B and myriad other acronyms I’m still trying to keep straight. I first started learning about search engine optimization and the ways in which Google factors keywords, site navigation, link quality and much more into its algorithms for ranking websites. It was a lot to learn, and it opened my eyes to how amazingly complex SEO is. I had always assumed that Google ranked websites using a magic combination of faith, trust and pixie dust… I’d never actually realized that it was much, much more complicated. I suddenly understood why my personal website only ranks third for a Google search on my name (and I began to understand what I can do to improve that!). There were a lot of things that surprised me about SEO. One thing in particular was the frequency with which companies try to manipulate Google’s system. Most websites increase their organic website ranking through dutiful and time-consuming keyword research, SEO audits, internal and external link building, affiliate programs, and more. Some websites, though, think they can skip all that busy work and get their pages to the top of Google, fast. They do this through “black hat” SEO techniques, which involve spammy practices such as paying for links on websites that have nothing to do with your site. An infamous case of this comes from JCPenney, whose products turned up at the top of Google in 2011 even for seemingly generic searches like “tablecloths.” This happened because their products were unscrupulously linked on hundreds of thousands of completely unrelated and underhanded websites, thus tricking Google’s algorithms into thinking they were credible and relevant product pages. When JCPenney’s tactics were discovered, the company was stripped of its superior Google ranking, and it would be a long (and nearly impossible) climb back to a respectable ranking. I faced a long climb, too, when I started at MAKA. Besides SEO, I also needed to learn about paid search engine advertising, Facebook and Instagram ads, content writing and more. It was certainly overwhelming at times, and throughout this experience I knew I had to grasp all the do’s and don’ts of the digital marketing industry so I would never make mistakes like JCPenney’s. That’s not to say I haven’t made any mistakes. I definitely have…and I’ll probably make more in the future. But, because I’m such a newbie to the world of digital marketing, I can see everything with a beginner’s perspective. My viewpoint is very similar to that of our clients, who have often dipped their toes into the world of digital marketing but still have lots of questions. With the help of my co-workers (who, I assure you, are much more knowledgeable than I am) I’ll do my best to answer those questions, and I’ll probably ask a few of my own, too. I can understand our clients’ confusions or concerns because I’ve experienced them too during these past three months. Because of this, I know that we can figure everything out together. All it takes is a little trust… and maybe some pixie dust. Recently Google has come under fire over allegations that the company is not doing enough to ensure that ads are only being displayed along with appropriate content. Specifically in question is Google’s policy regarding hate speech. Hate speech (including content that incites hatred or promotes violence against individuals or groups based on race or ethnic origin, religion, disability, gender, age, veteran status, or sexual orientation/gender identity), harassment, bullying, or similar content that advocates harm against an individual or group. Although these policies exist, recently there has been debate over whether Google is doing enough to enforce them. After discovering that their ads were being displayed next to potentially objectionable content, several major advertisers including Verizon, AT&T and Johnson & Johnson have pulled their ads entirely from YouTube and the Google Display Network. In response, Google has issued a statement asserting that they will be expanding their content review team, as well as developing new AI and machine learning based tools to increase their ability to review material in a timely manner (Expanded Safeguards for Advertisers). Additionally, Google announced plans to release a new escalation process though which an advertiser can report a policy violation and quickly get the content in question reviewed. This discussion only concerns image, text and video ads served through use of the Google Display Network, and does not extend to text or shopping ads displayed on the Google search engine results page. MAKA Digital currently uses all available content filtering options to prevent our clients’ ads from being displayed next to content that does not reflect their brand values. This includes restricting ads from showing on sites with certain classifications, for example those with profane language or featuring sexually suggestive content, as well as actively restricting individual sites we have reviewed and determined to be inappropriate on a case by case basis. Our ability to control where ads are served is limited by the native functionality of the Google AdWords interface. Since Google currently does not guarantee that their review process will catch objectionable content 100% of the time, we similarly cannot guarantee that your ads will never be displayed on a site that does not reflect your brand values. Where and when an ad is displayed is determined by a complex system of targeting that is specific to individual users, and it is simply impossible to predict all potential combinations and outcomes. Option 1: Continue to invest in advertising on the Google Display Network, and allow existing and future safeguards to protect your brand. Existing practices and policies are extremely robust, and do a great job of identifying objectionable content. Although a small percentage will inevitably slip through the cracks, this is unlikely to have any negative effect on your brand. Option 2: Pull spending from the Google Display Network until further notice. This is the only way to guarantee that your ads do not ever show on a site that you may find objectionable. MAKA will continue to monitor changes in Google’s policies and tactics, and will make periodic recommendations based on the potential risk involved with reinstating Google Display Network advertising. If you choose to go this route, MAKA will work with you to identify an action plan of alternative advertising methods to maintain your brand’s share of voice. MAKA is here for you. We want to encourage a transparent dialogue about how your brand is represented in the digital space. If you have any questions or concerns, we encourage you to reach out to us directly so we can discuss your needs in detail, and craft a comprehensive action plan. The Impact of the Latest Facebook Algorithm Update: What Does it Mean for You? There is no denying that Facebook can be a large player in your marketing mix, helping to generate awareness, driving traffic to your site, and growing revenue. But in the same breath, Facebook's latest algorithm changes make getting your message seen increasingly difficult. So, what can you do about it? First, let's take a walk through the history of Facebook's changes. April 2014: Facebook updated the algorithm and your organic reach (reach without boosting posts) dropped from about 20% to about 2%. June 29, 2016 & carrying into 2017: Facebook announced another algorithm update and changed the newsfeed to prioritize posts from family and friends. As a result of Facebook’s algorithm changes, Facebook is reducing reach for business pages, community pages, and groups. Creative, unique and authentic content is the only way to maintain the organic reach. Facebook is positioning themselves to be a major player in the video space. Native videos are being given preference by Facebook. Make sure you are utilizing this content format – it is HOT right now and will get you reach up to 5x or more that of other content types. If you go to your Facebook page, it’s very likely that the first post you see is from one of your friends. And it’s likely that the second post you see is a ‘sponsored post’ or ad. The goal of boosting posts is to get this coveted 2nd spot at the top of the feed and get seen nearly on-demand when users are visiting their pages and refreshing feeds. 3. Reduce your dependency on social media to grow your brand, traffic and revenue. Over 65% of consumer research begins with a search engine. Search Engine Optimization (SEO) is the act of leveraging Google’s free listings to get your business in front of ready-to-purchase clients. Ensure your website is optimized to rank better than your competitors in Google and other search engines. For our full Point of View on this topic, which includes more detail and additional tips, download our PDF here. For help with digital marketing strategies for your business, drop us a line at hello@makadigital.com. Testing the user experience of your website is a little daunting. After endless hours of finessing your landing page call-to-actions, perfecting your cart experience, and prepping your order confirmation emails, you're finally ready to pull the traffic lever with some paid media traffic. But there's a nagging feeling in your stomach. It's the feeling that you just designed your entire website, or perhaps your entire company in a vacuum. Sure, you had meetings about it. A lot of meetings in fact. You and your fellow co-workers crammed yourselves into airless conference rooms and stuffed your faces full of wireframes on whiteboards. You argued, you clapped, you sighed. Until one day, you were finally ready to launch that big update. You tell yourself that if you get it out on time, you'll see traffic numbers soar, bounce rates drop, and conversion rates rejoice. Except every time your finger dances on the 'launch' button, you panic. Why? You panic because you just invested an enormous amount of energy and money in an echo chamber and have yet to see or hear what anyone outside of your company actually thinks about your new site experience. This, my friends, is where the tippy test comes in. Every summer, campers gather in boathouses stacked on sparkly lakes where they nervously grip their life preservers and wait on the dock for their tippy test to begin. A tippy test is when you take a canoe out into lake and purposely capsize it, then flip it back over, and hop back in. It's a crucial moment that determines your competence in the water. Are you ready to handle a boat on your own? Do you panic in that moment of uncertainty when you're treading cold lake water and awkwardly pushing the boat right side up? Or, are you at ease in this test of strength? In a singular moment, you either paddle back to shore with total confidence, or total insecurity. That's the very same resolve you get with user testing. User testing helps safeguard against getting out into the middle of the lake and realizing you never learned how to swim. In just a few short minutes, you know whether or not your new experience will sink or swim out in the wild. Before a project launches you're insecure. You need validation. You're vulnerable and it's easy to avoid criticism. It's scary to open yourself up to zingers, but once you send your site off to the user testing ethers, you'll come back with SOMETHING. Whether that something delays your launch for another week, or tells you you're a genius, at least you know you can float. If you're looking for help with user testing, or a fresh set of eyes for website conversion optimization, give us a shout. If you're looking for tools to do your own testing, we like to use User Testing. If you're looking for a great summer camp to do a tippy test, our hearts belong to Camp Dudley.